Can the first recognised Android dock hit the ground running? 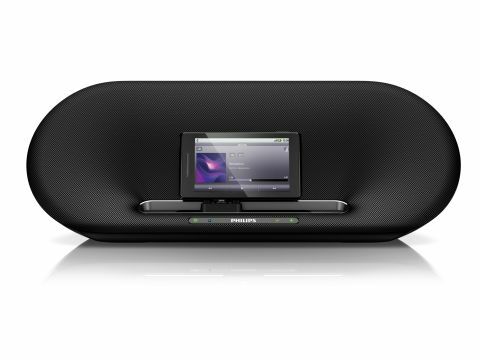 The Philips Fidelio AS851 is the flagship model in Philips' new range of Android docks. Featuring two 15W 3-inch speakers, a microUSB 'flexidock', Bluetooth connectivity, a slick design and a £199 price tag, it's a premium product for sure. But is it really the Android dock that users are looking for? Whether you love, hate or stand indifferent on Apple's iOS devices, you have to admit that Apple makes it very easy for third parties to build peripherals. Stick your iPhone in any dock and it'll immediately start playing music and system sounds through the speakers without needing to set anything else up - that's the kind of user experience Philips is up against here. It's a system so abundantly easy to use that even a lobotomised crab could use one. Or Brian Belo. While Android is the best-selling mobile phone platform in the world - there are now over 200 million Android phones out there already - there are too many differences between devices to make a dock that suits them all. There's different sizes, different connection types, different connection placements and orientations, different software layers, different internal components - the list goes on. So making a 'dock' that works "for Android" in general is simply not possible - hence why most manufacturers concentrate on general Bluetooth systems. For instance, if you try to dock your Samsung Galaxy Tab 10.1 to the Fidelio AS851 you'll find that the female proprietary connector is totally incompatible with the male microUSB phallus on offer. So if you're thinking of buying this dock, you should first make sure that your device has a microUSB connector. If it doesn't, don't waste your money. We tested the AS851 primarily with a brand new HTC Sensation, and we have to say we were not hugely impressed. The tiny nature of the microUSB connection makes the dock very fiddly to mate with your phone. The male docking part itself is fairly clever in that it can be slid across the front of the dock and spun round, so depending on the orientation and position of the port on your phone, you'll be able to dock it and have it sit in the middle. For phones such as the Samsung Galaxy S II which has its port on its base, right in the middle, the dock works fairly comfortably. But with our HTC and many other handset models, the phone needs to sit sideways which is a lot more fiddly to both dock and use. We were using the Spotify app, for instance, which cannot rotate into landscape mode and so when docked we had to operate it sideways which was not fun. Simply getting our HTC Sensation to mate with the dock was fiddly in itself, and making it stay on the dock while using the touchscreen was tricky too - it's extremely easy to knock off its perch because the microUSB port is so puny. The handset itself is heavy, and so the flimsy connection does not offer enough support. Assuming you can get your phone docked though, you'd assume that Android would then send its audio signal straight to the dock, right? Wrong. Android is not able to do this currently, which means your phone also has to pair with the Android dock via Bluetooth. The Philips Fidelio app, which you must download from the Android Market, auto-launches when you dock and turns Bluetooth on and pairs for you so it's not a huge deal. But the app was continually flashing up "switching Bluetooth on" notifications while docked, which was irritating. And the app actually launches whenever you plug the phone into any power source rather than just when you dock, which is another annoying feature – it's not clever enough to work out what it's plugged in to. You can, at least, remove your phone from the dock without your music being interrupted, but if you want to do that why not just buy a standard Bluetooth system and use your charger? And this leads us to sound quality. For a dock with a recommended price of £199 you'd expect some pretty amazing sound, but unfortunately we were left wanting more. Anyone easily seduced by bass will be kept happy, with low and high end, too, coming through fairly well. But there's a huge, gaping, awful hole in the midrange which really knocked the stuffing out of all the music we put through it. This dock is a long way from being a match even for Philips' own high-end iPhone/iPad speaker dock, the DS9010. It's a huge disappointment and so audiophiles or indeed anyone who thinks they'll notice sub-par sound quality should probably stay away – this is a very common issue with docking speakers, but this isn't a cheap product and that's why we're not letting it off the hook. If you need to pair via Bluetooth, why not just save some money and buy a standard Bluetooth speaker system? For £200 (ok, you can pick this up for £175 on Amazon, but still…) you can buy some really decent kit which sounds better. And that's what we'd recommend you do. There are reasons why there aren't loads of Android docks out there to go with those 200 million phones, and anyone using this system will soon find out what those reasons are.